"Father, forgive them, for they know not what they do,” said the Divine, making excuses for his murderers, not after it was all over, but at the very moment when he was dying by their hands. When the Father succeeded in answering his prayer, then his forgiveness in the hearts of the murderers broke out in sorrow, repentance, and faith. Here was a sin dreadful enough surely—but easy for our Lord to forgive. But must we believe that Judas—who repented even to agony, who repented so that his high-prized life, self, and soul, became worthless in his eyes and met with no mercy at his own hand—could find no mercy in such a God? I think, when Judas fled from his hanged and fallen body, he fled to the tender help of Jesus, and found it—I say not how. I believe Jesus loved Judas even when he was kissing him with the traitor’s kiss, and I believe that he was his Savior still. I cannot believe O my Lord, that thou wouldst not forgive thy enemy, even when he repented. Nor will I believe that thy holy death was powerless to save thy foe—that it could not reach to Judas. Have we not heard of those, thine own, taught of thee, who could easily forgive their betrayers in thy name? And if thou forgive, will not thy forgiveness find its way at least in redemption and purification? Thine own, taught of thee, who could easily forgive their betrayers in my name. During his Passion, Jesus asked His Father to forgive His killers. Mac Donald, if he errs, does so on the side of Light, Grace, Mercy, in a large, yet stunted, knowledge of the height, length, width, and breadth of the love God shed abroad upon our hearts in Christ. In His Passion, compassion, forgiveness, and love is our hope. Forgive us our debts as we forgive. Let it go. Cold self-love, and envy, avarice, and ambition, are of damning darkness. 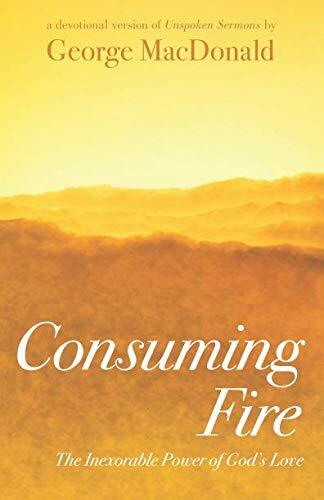 A direct link to the Consuming Fire Daily Devotional will be in your email box in the morning. A good way to begin the day!